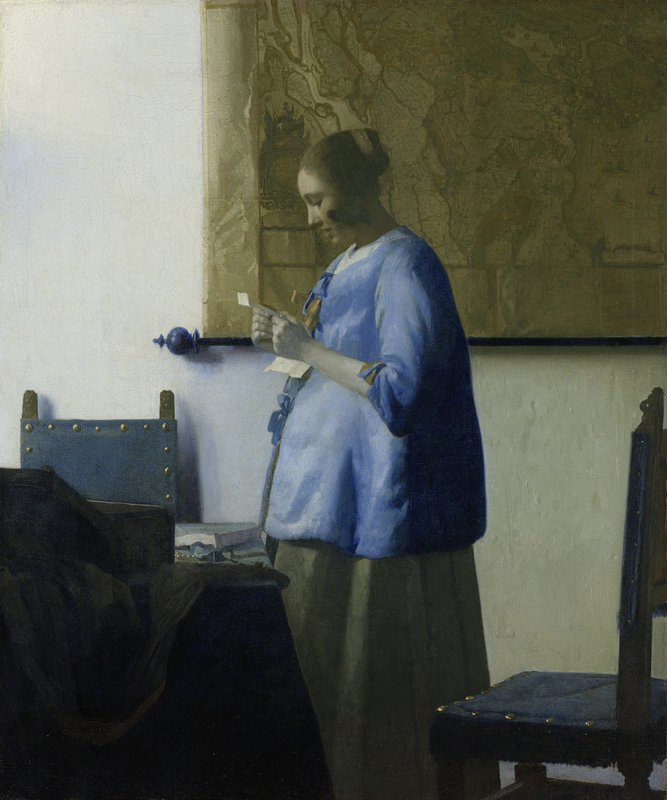 Johannes Vermeer’s masterpiece Woman in Blue Reading a Letter that was restored to its original beauty before going on a tour of Asia last year has touched down in the United States. From February 16th to March 31st, it will be on display at the Getty Center in Los Angeles, its only stop in North America before it returns to the Rijksmuseum in time for the museum’s grand reopening on April 13th. 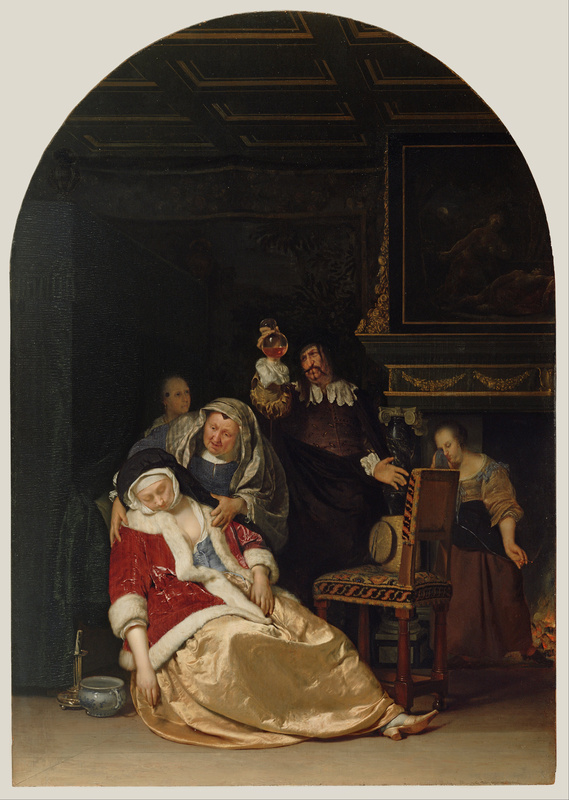 Taking advantage of the rare presence of such a great example of an interior subject from the Dutch Golden Age, the museum is exhibiting a number of other pieces along with the Vermeer which focus on people engaged in private moments inside the home. Works from the Getty’s permanent collection include Gerard ter Borch’s Music Lesson, Jan Steen’s Drawing Lesson, Pieter de Hooch’s Woman Preparing Bread and Butter for a Boy, and Frans van Mieris’s The Doctor’s Visit. An additional piece, An Elegant Lady Writing at Her Desk with a Dog beside Her, has been loaned for the exhibition from a private collection in New York. I love the geometry in Hooch’s painting and I can’t help but wonder what the doctor is peering at in his balloon flask in the Mieris work. This is a great time to be on the West Coast if you’re a fan of Vermeer and other Dutch masters. The de Young Museum in San Francisco is currently hosting what is probably Vermeer’s most famous work, Girl with a Pearl Earring, as part of an exhibition of 35 important paintings from the Royal Cabinet of Paintings Mauritshuis in The Hague. 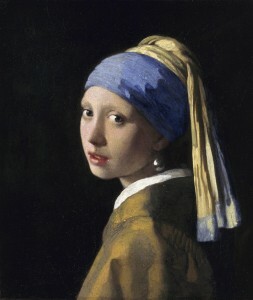 Girl with a Pearl Earring: Dutch Paintings from the Mauritshuis features 35 important works by Dutch Golden Age masters like Vermeer, Rembrandt and Jan Steen. A companion exhibit at the de Young, Rembrandt’s Century, will be centered on Rembrandt’s etchings and those of other artists who preceded and followed him. Girl and friends will travel to the High Museum of Art in Atlanta next, where they will be on exhibit from June 22, 2013 to September 29, 2013. The last stop before they return to the Netherlands will be Frick Collection in New York City. You can catch them there from October 22, 2013 to January 12, 2014. Again we have a major renovation to thank for this artistic bounty. The Mauritshuis is also closed right now while the space is being renovated and expanded. It will remain closed until mid-2014 after which it will have a grand reopening of its own. This entry was posted on Saturday, February 16th, 2013 at 11:55 PM	and is filed under Modern(ish), Museums. You can follow any responses to this entry through the RSS 2.0 feed. You can skip to the end and leave a response. Pinging is currently not allowed. Increasingly concerned at the frequency with which major works of art are flown around the world, principally for the financial gain of the lending and borrowing institution. This is, I believe, the second time in recent years that Girl with a Pearl Earring has flown the Atlantic to the US. Sooner or later, disaster will almost certainly occur. Pretty well always does, doesn’t it? Not like there are hundreds of Vermeers around. There’s definitely filthy lucre involved, but I think in the case of both of these traveling exhibits the primary motivation is keeping the Rijksmuseum and the Mauritshuis in the forefront of the public eye during their long period of closure. Security and insurance for these pieces are sky high. Damage during transit is unlikely and I’d honestly be far more concerned about them being stolen when they’re back home. Thieves seem to prefer hitting museum permanent collections. Livius, I think I can help you — the doctor is looking at the patient’s pee, probably doctored with some of his own chemicals. This is a motif in a lot of Jan Steen’s doctor visits, & according to Walter Liedtke in Dutch Paintings in the Met, one 17th C term for quacks was “piss lookers,” & they “used flasks of urine like crystal balls.” Sometimes they burned a ribbon in the pee as some sort of pregnancy test, but that doesn’t seem to be the case here. It’s so finely painted I think we would see the ribbon. Thank you again for another beautiful post. Those Getty paintings are of exceptional quality, and you always get such magnificent images. I have to add that I agree with the previous comment – I couldn’t believe they were letting the Girl with the Pearl Earring travel, with only 3 dozen Vermeers in existence. I knew it was urine — albeit disturbingly colored — and was being suggestively squeamish about it. I hadn’t hear about the “piss lookers” term, though. That is too funny. I think the renovations have allowed these Vermeers, which normally stay put with rare exceptions, to accrue a few more frequent flyer miles than they otherwise would have. I read Girl with a Pearl Earring several years ago, a very good book in my opinion! I’m looking forward to seeing the painting at the High, since I live in Alabama, right next door! I enjoyed that book too, and the cinematography of the movie really made it look like a moving Vermeer. I’ll be catching the exhibit at the High as well. You’re right about “piss lookers” but the doctor may not have been a quack. Arab medicine, from which Europe took much of its knowledge, used the smell & color of urine as a way to pinpoint a number of diseases. Even today, sweet-smelling urine may point to diabetes, although modern doctors just poke a Teststick into it. Oy. I’m too chicken to be a doctor today. I’m about 50 million times too chicken to have been a doctor in the Renaissance. Awesome! I’m going to be in Los Angeles on March 17th for Der Fliegende Holländer at the L.A. Opera, so I’ll have to pop in across town and make sure to take a peek. I checked the hours, and they open at 10:00 a.m., so that will give me three hours to poke around the museum and drive across town to arrive in good time for the Sunday matinee. Doctors who looked at, smelled, and sometimes tasted a patient’s urine were also derisively called “piss Prophets” by those who put little faith in their abilities. There are, actually, a few illnesses that can be diagnosed by looking at pee; blood in the urine is a good indication of a bladder or kidney infection, diabetics have sweet smelling and (I’ve heard) tasting urine.